Please book with eventbrite here. 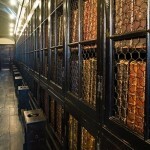 * Chetham’s: Europe’s oldest library, housed in Tudor buildings that were for nearly two hundred years a college of priests. 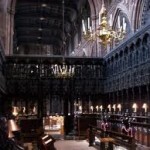 * Manchester Cathedral: an ancient place of worship that recently celebrated 800 years as the most spectacular church in the area. And all around the site of the “Old Town” where Manchester grew by the rivers Irk and Irwell, and the Hanging Ditch. This is a tour into the heart of mediaeval Manchester, replete with extraordinary stories. There was the Catholic priest dragged by heels from the prison to what is now the Cathedral. There was the story of Britain’s leading anti-slavery campaigner who was cheered here in the Cathedral for his beliefs before he set off for Liverpool where they tried to throw him in the Mersey. We will leave no (mediaeval) stone unturned.